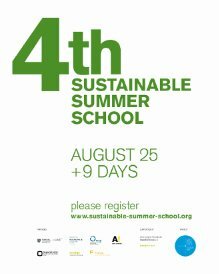 The 4th Sustainable Summer School« for students from all around the world starts on August 25th and ends September 3rd, 2012 in Helsinki. This year the Sustainable Summer School is hosted by the Aalto University and takes place in Helsinki on Suomenlinna island. In the Sustainable Summer School the students will work together on different subjects in workshops – conducted by experts. The summer school is completed by an expert day to provide the participants with up-to-date knowledge and deep insights in this years topic: »Sustainable Transition«. The Sustainable Summer School is part of the Aalto University program contributing to the World Design Capital activities. Many had considered climate change an impossible subject to dramatise. But two new plays that opened at the Bush in May proved them wrong. Steve Waters talks to Robert Butler about ‘The Contingency Plan’, his double-bill of plays about climate change, and how they were inspired by James Lovelock, the 1953 floods, and the Transition Town Handbook. To coincide with the UN Conference in Copenhagen, Radio 3 also broadcasts a version of ‘The Contingency Plan’ (this Sunday, 8pm) and two readings of the play, with the original cast, will be produced at the Bush on 15 and 18 December.